Whether you’re at the gym, at home, or on the go, a muscle-rolling massage stick can be your best friend—even when you’re using it to put the hurt (so good) on your muscles! If you’ve read our article on foam massage rollers, then you know that massaging your muscles can be very beneficial to your health by preventing injury, releasing stress, and relieving pain. But what’s the difference between a muscle roller and a massage stick? Muscle rollers use body weight, while massage sticks use the pressure you apply with your hands and upper body. Another important difference is that massage sticks are notably more portable than muscle rollers. So if you’re interested in portability, as well as pain relief and prevention, check out our top picks for muscle-rolling massage sticks! 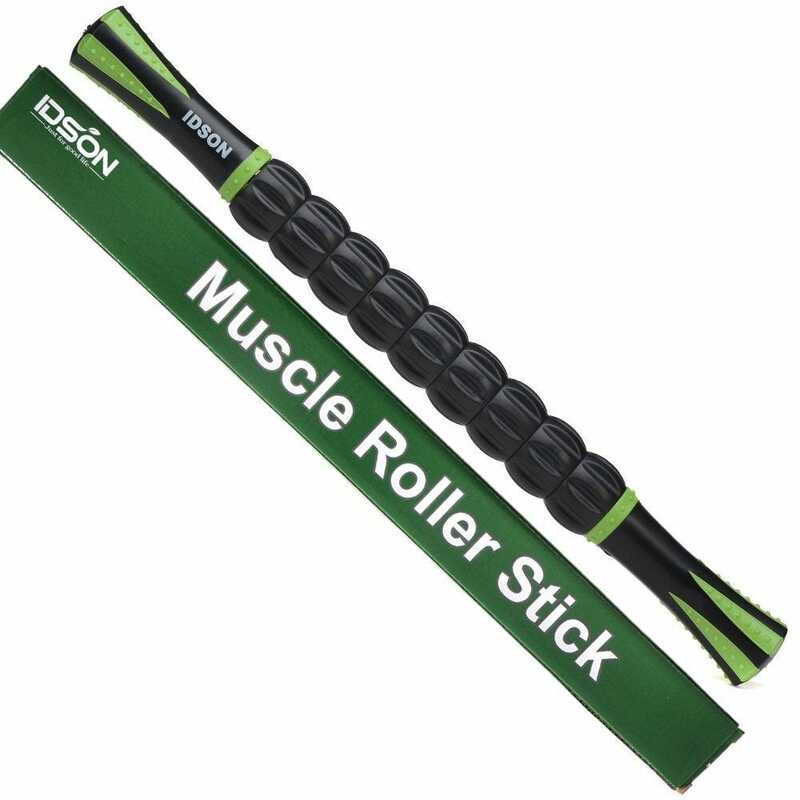 The IDSON Muscle Roller Stick is super portable and easy to use. Like the other muscle-rolling sticks on our list, the IDSON is a long stick that can easily fit in a bag, be stored in a car, or just be carried around. It’s 17.5 x 1.5 inches in size, so it’s not only easy to carry but it’s also long enough to relieve pain in even the largest muscles. This roller is great for those who want to relieve soreness on the go without having to have a lot of space on the ground to stretch out. Relieve tension in your legs, arms, and back with the IDSON by gripping on the comfortable handles and rolling the 9 rollers that are on the rod over your muscles. If you like this massage stick, but want one that’s longer, check out The Stick Travel Stick. The IDSON happens to have simple rollers that are great for getting out the pesky knots, but if you’re looking for a much deeper massage, check out our next two entries. 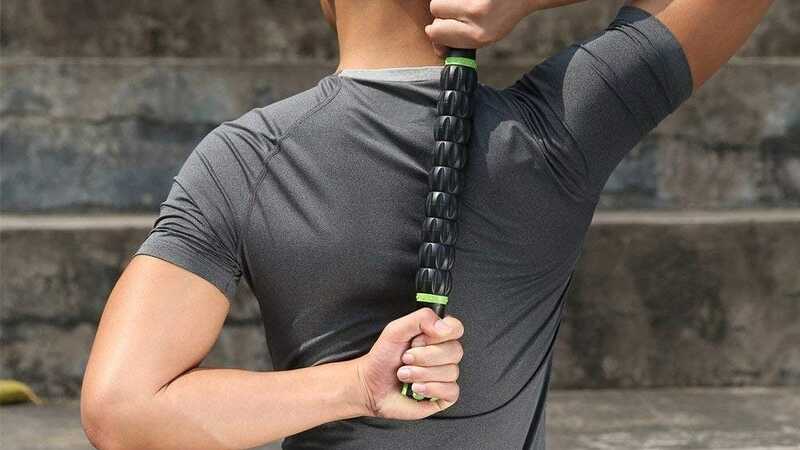 If you’re looking for a massage stick that’ll target your soreness more deeply than a smoother massage stick, then consider checking out the Doeplex Muscle Roller Massage Stick. This roller has 10 individual spinners on the rod that have raised nubs and can individually spin 360 degrees—allowing for easy movement along the body and limbs. While the massaging is easy, the quality is still great, especially with anti-skid grips that allow you to hold onto the Doeplex without letting go. This massage stick is a little over 17 inches in size (the rollers section is 8.66 inches long), making it easy for you to carry on the go. Lastly, this roller isn’t made of hard plastic, but is still firm—making this a great way to get a solid massage without being too uncomfortable on your muscles. 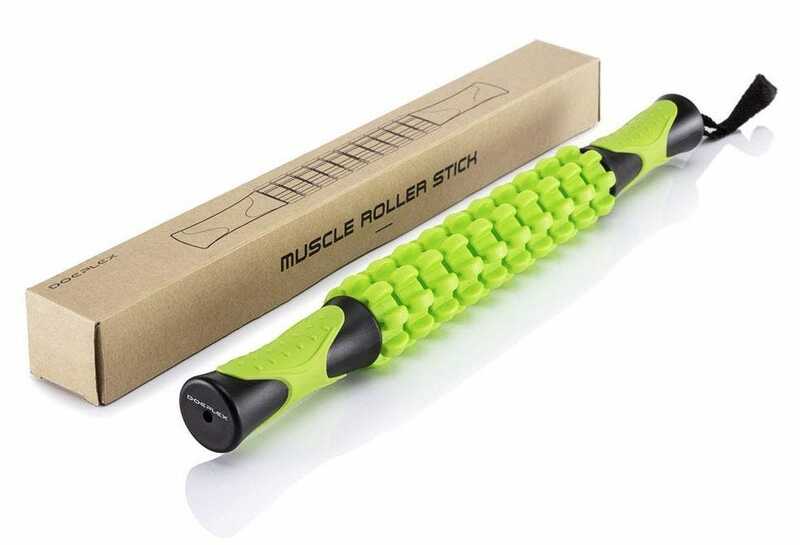 While the Doeplex is great for getting a deeper massage, this HIPPIH Muscle Roller Massage Stick is great for targeting those troublesome aches, pains, and knots. This roller has three balls on the rod, each with smooth spikes on the surface to penetrate deep into the muscle. Each ball spins separately and freely, so you can grab the handles and roll it over your legs, bag, arms, shoulders, thighs—wherever your soreness or tightness is located! The large, hedgehog-shaped balls on the HIPPIH not only provide a deep tissue massage, but they also stimulate the issue and promote blood flow to tired and sore muscles. All of the muscle sticks we’ve chosen so far massage your muscles by the strength of your hands—but what if you want a different way to get those knots out? This RAD Muscle Flushing Kit lets you reach all areas of your body by combining the self-rolling of your hands with the weight of your body on the tool. Like a foam roller (but not as thick), the RAD can be placed on the ground so you can use your body weight to massage deep into the muscles—a massage that the pressure of your hands may not be able to reach with a normal massage stick. When using this as a roller on the ground, you can keep the rod inside of the hollow roller or take it out. The best part of this massager is that you can easily just switch to using the RAD as a stick muscle roller. Just slide the rod back into the tube and hold onto both sides of the rod to roll over your muscles. You can massage yourself anywhere with this kit, whether you’re on the lying on ground, sitting in a chair, or even stretching out at the gym! The kit is significantly more expensive than the other options on our list, but it’s a staff favorite. Like the RAD Muscle Flushing Kit, the Body Back Buddy is a different type of muscle stick that has 11 knobs strategically placed along an S-shaped stick that can reach every pressure point in your body. Because of its S-shape, you can use it around your neck, behind your back and shoulders, on your legs—even under your feet. There are even longer knobs that you can use to grip the tool for better leverage or to reach deeper into the knots in your muscles. 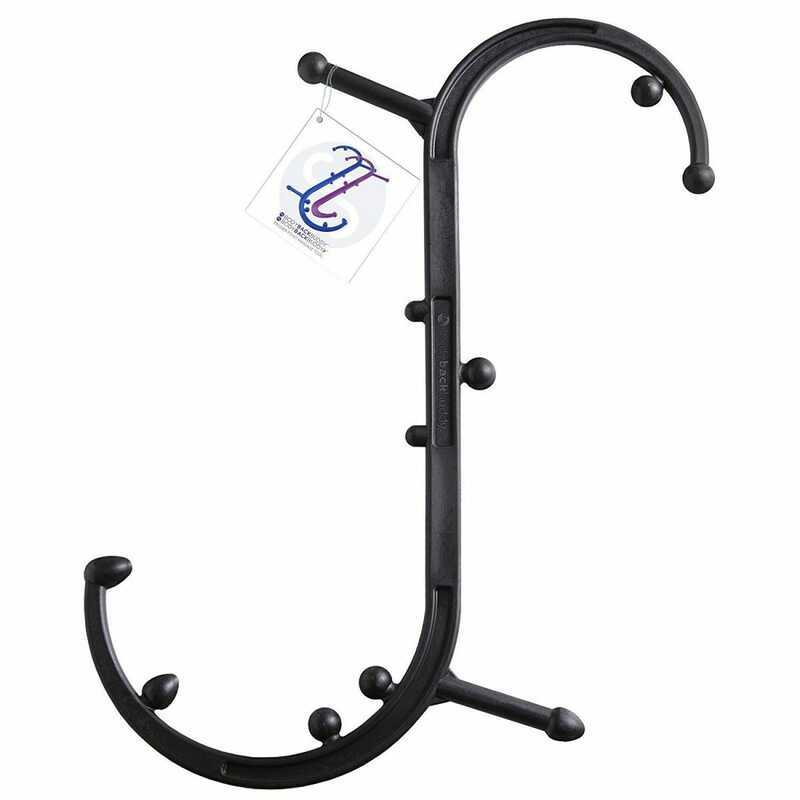 Made out of durable, glass-filled polypropylene material, the Body Back Buddy will be sure to reach all areas of soreness without bending or breaking, even when reaching the toughest spots. It’s also lightweight and only 25 inches long, so if you find you can’t live without it you can stash it in a suitcase or take it to work. This is especially helpful if you’re using this tool for physical therapy or to rid yourself of unwanted pain.